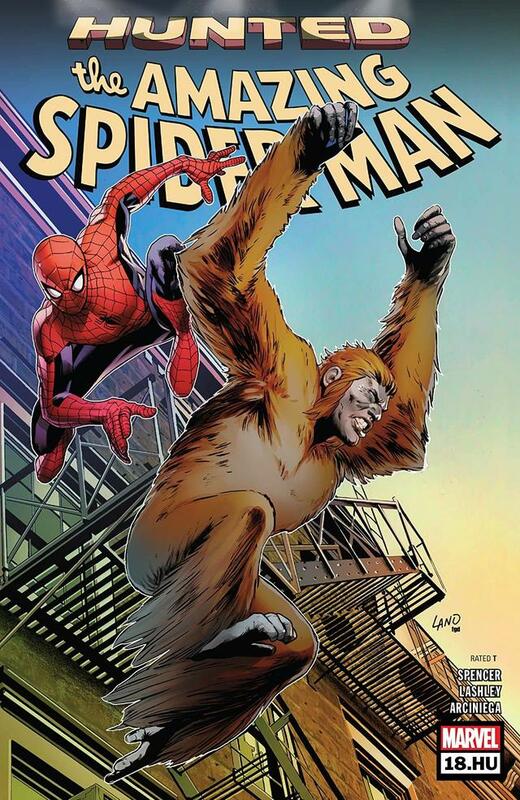 Spider-Man’s most underrated primate-inspired nemesis is back in “Hunted”! This month, Gibbon returns in AMAZING SPIDER-MAN #18.HU! Gibbon may not be one of the Marvel Universe’s biggest threats, but writer Nick Spencer and artist Chris Bachalo certainly know what a scrapper he can be. 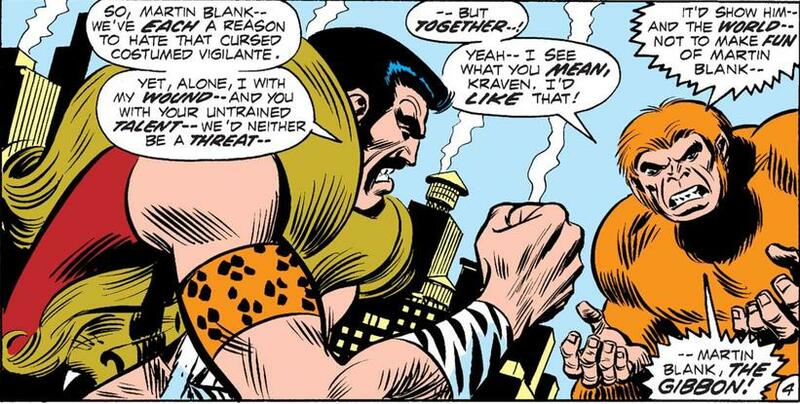 And since his return takes place during the “Hunted” saga, perhaps Kraven the Hunter knows as well and has set out to recruit – or end – the primate perpetrator. To truly appreciate the danger Spidey will encounter, here are some of the Gibbon’s greatest hits. Martin Blank, not unlike the X-Man Beast, had an X-Gene that gave him a vaguely primate appearance as well as increased strength and agility. Very aware of how his mutant “gift” affected his appearance, he donned a gibbon-inspired suit and tried to help out Spider-Man. While the wallcrawler let him help out now and then, when Blank broached the topic of them becoming more of an ongoing team, Spidey literally laughed in his face. This, understandably, did not endear Gibbon to the webslinger. Kraven, aware of Spider-Man’s dismissal of Gibbon and the anger Blank felt in response, took Gibbon under his wing. In addition to molding him into a more violent villain, the Hunter also prepared Gibbon a soup made with herbs that increased his savagery and animal instincts. With his enhanced abilities, Blank found Spidey and attempted to let the thoughtless arachnid feel a bit of his emotional pain. Alas, Peter Parker trounced Blank. Blank was not seen for years after that confrontation. Evidently, he ended up in prison, and unlike many of Spider-Man’s villains, decided to do his time without attempting to escape. However, when Spider-Man showed up, Gibbon sensed a chance for a rematch. Old habits die hard though and upon finding himself between Spidey and the Beetle, Gibbon opted to side with his former idol and puts Beetle down with one punch. After a brief attempt at capering alongside the likes of the Spot, Gibbon could not resist the siren song of heroics. This led him, with help from the Grizzly, to aid Spider-Man in thwarting crimes including, most prominently, a bank robber orchestrated by the White Rabbit. While Spider-Man still refused to see Gibbon’s use, both an action figure manufacturer and the Initiative noticed him big-time. The toy company created a best-selling figure out of his likeness and the Initiative recruited him as a possible member after the fallout of CIVIL WAR settled. When the Punisher attacked a funeral for Stilt-Man, the resulting firefight left Blank burned so badly that he couldn’t initially regrow his hair. His wife, Princess Python, was left blind. Understandably enraged, the Gibbon hunted the Punisher for weeks. However, when he finally stood face-to-face with the gun-toting vigilante, Gibbon chose the path of mercy. 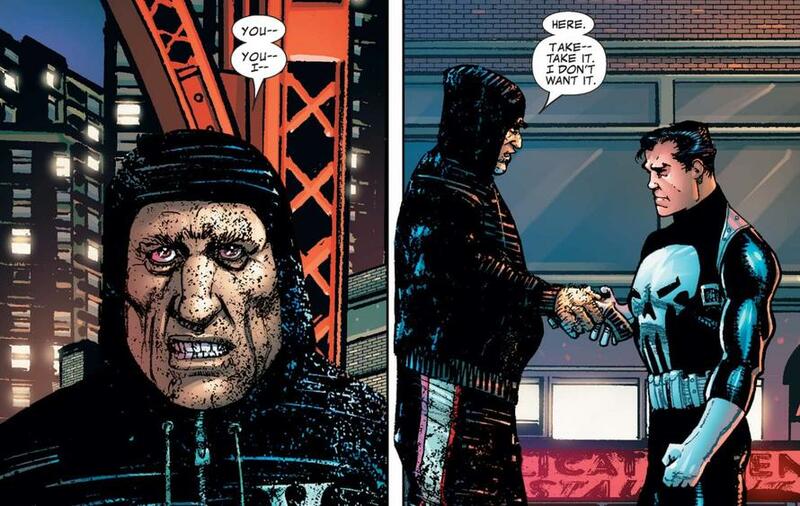 He turned over his firearm to the Punisher and walked away, content that he was a better person than Frank Castle would ever be. Since then, the Gibbon has bumped along, seemingly forced to play hero or villain by the whims of the universe. At one time, he saved an Earth entirely populated by primates from a team of vampires pretending to be the Avengers. After that, he was stabbed by a villain while fighting Spider-Man and Deadpool. But how, you ask, does any of this point to him being dangerous? Consider this: Who would be more dangerous than a man repeatedly hurt by the world despite only wanting to help it? Especially when he finds himself standing down his hero, who has repeatedly treated him like a joke, and swept up in the nonsense of the man who first made him a Super Villain? AMAZING SPIDER-MAN #18.HU, written by Nick Spencer with art by Chris Bachalo, is available now online and at your local comic shop!